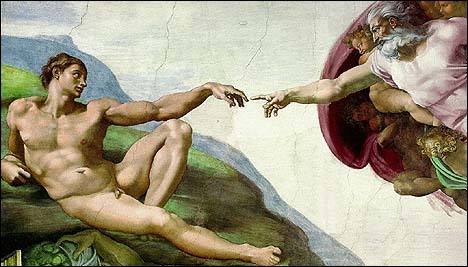 The most famous image of creation is Michelangelo's "Creation of Adam" (1511), fresco, ceiling of the Sistine Chapel, Vatican. The Bible tells us that he created it from nothing, and in an orderly way moved from the most primitive forms of creation to the most advanced -- man. In a beautiful and carefully structured poem of creation, God creates from day to day until he rests on the seventh day (Genesis 1:1-2:4). In this chapter we'll be examining God's titles and metaphors as Creator, Builder, Architect, God of heaven, Maker of heaven and earth, and Potter. We'll begin by examining a wonderful creation passage in Isaiah's prophecy, where God speaks about his own role as Creator and its implications for his created beings. Ancient peoples were used to thinking of gods of each nation -- each serving its own god or gods. Yahweh asserts that he is not bound by nationality or geography. Yāṣar means "fashion, form, shape, frame" Yāṣar denotes the activity of the potter as he shapes and fashions vessels and figures with his hands.3 While the word occurs in synonymous parallelism with other creation verbs, its primary emphasis is on the shaping or forming of the object involved. "4 While bārā´ emphasizes the initiation of an object, yāṣar emphasizes fashioning and shaping. God's creation of darkness and light are revealed in the first day of the Poem of Creation (Genesis 1:1-5). But parallel to light and darkness are prosperity and disaster. The NRSV puts is: "I make weal and create woe" (We get our word "wealth" from "weal," which means "well-being, health.") The KJV renders it: "I make peace, and create evil." Does this mean that God is the author of sin and evil? No. The word is ra`, and can mean either "evil" or "misery, distress, injury. "5 The point of this verse is that God can bring either wealth or poverty, good circumstances or bad. There is not a good god and a bad god at work. The one God is the only uncaused Cause in the universe! Does that mean that everything that happens is God's "perfect will" for our lives? No again. His heart is love, his preferred means is through blessing. But while God can bring difficult circumstances to bear, we must realize that we have an enemy, Satan, who actively seeks the harm of God's people. God has chosen to "allow" or "permit" Satan to work on earth for a limited time, but ultimately Satan himself will be overthrown and destroyed. In the sense that God allows something, you might speak of God's "permissive will." The reason God allows Satan to work is a mystery. Theologians and philosophers call this the Problem of Evil. We long to know why things happen to us, and most of the time end up not knowing. A better question is: "God, what should I be learning from this circumstance?" We do have a promise from Scripture: "We know that all things work together for good for those who love God, who are called according to his purpose" (Romans 8:28). Having said that, God telling us in Isaiah 45:7b, "I bring prosperity and create disaster," reminds us of two things: (1) God is not to be trifled with, and that (2) no misery, problem or disaster that may occur is out of his ability to restore, heal, and relieve. He is the Creator and can, if need be, re-create that which has been destroyed. to him who is but a potsherd among the potsherds on the ground. The word Maker is the same as Potter (yāṣar), which is probably a better translation in this context. A potsherd (ḥereś) can refer to either (1) an earthenware vessel that is baked or fired, or (2) a fragment of earthenware, sherd.6 Here he's referring to pots among other earthen pots. Clay, of course, is the raw material for pottery, a type of soil that is almost universally available. When water is added it acquires plasticity, that is, it can be worked and shaped. When fired it holds its shape. Pottery was developed in the Neolithic age. Coarse objects were originally formed on a mat. Vessels were made by laying long coils of clay one on top of another, around and around, as the walls of the jar grew higher and higher. The potter's wheel appears all over the Middle East about 2750 BC, which greatly increased the speed with which a potter could work and boosted his output tremendously. Such wheels usually consisted of two stones (Jeremiah 18:3), one pivoting above the other in such a way that the potter or his assistant could turn the upper stone as the potter molded the clay.7 The ancient potter began preparing the clay by refining it (if necessary), then pounding to get rid of any air bubbles that could ruin the piece when it is fired. If you've ever watched a potter at work you know why the Bible uses this analogy for the Creator. As the wheel spins, the potter uses her thumbs and fingers to form a hollow in the center of the clay, then build the walls of the vessel by pressing on the walls outward and upward to thin and heighten them. A good potter can create bowl, pitcher, or cup in a few minutes. It is an outstanding analogy for creation that people in the Middle East could observe every day in every village -- beautiful and useful pottery vessels being made from what were just lumps of clay. God is our Potter, our Creator. and created (bārā´) mankind upon it. Can you see how ridiculous it is for a pot to complain to the potter about its construction and purpose? Or a child to question his father or mother about bringing him into the world? God answers this stupidity with a grand statement of his prerogative as Creator. Shouldn't the Creator of the earth and its inhabitants be beyond having to endure his creations' second-guessing of their Creator? Of course! Q1. (Isaiah 45:9-12) Why is it ridiculous for a pot to second-guess the Potter? How do we Christians do this? What is a better attitude and behavior before our Creator? We humans struggle to understand why things happen and chafe against the very concept of predestination that Paul discusses in Romans 9. But what do we know? We are like pots trying to order around the Potter and demand our freedom of will. How silly! The lesson of the Pot and the Potter is an important one. But let's explore this a bit further. Several times the Scriptures use dust and clay together with an analogy to man's humble origins and physical destiny -- and God as the Potter or Craftsman. "Clay" (ḥōmer) "cement, mortar, clay,"8 is the raw material of pottery. The word was also a term for the reddish clay of that area, particularly Palestine. In Hebrew there is sometimes a distinction between wet clay (ḥōmer) and dry clay,9 and dust or earth are sometimes related ideas. The usual word for dust is `āpār, "dust," i.e. "dry, fine crumbs of earth." See for example Isaiah 29:16; Job 10:8-9; 18:6; 33:6. Dust was everywhere and a sign of great humility when one would put dust on one's head to mourn or put one's face in the dust before a conqueror. Pottery is just fired clay which eventually breaks and turns to dust. Note the intentional play on words between Adam (´ādām) and ground (´ădāmâ). Observe the verb used for "formed" -- yāṣar, the characteristic verb usually used for "potter." The idea of potter isn't required by the verb -- once it is used to describe a metal-worker (Isaiah 44:12) and another time an idol-maker (Habakkuk 2:18). Surely the word refers to a craftsman. Hamilton contends that it is too much to render the verb yāṣar here as "do the work of a potter," since the medium is dust, not clay,14 though Speiser argues that `āpār is better translated here as "clods ... lumps of earth, soil, dirt. "15 I don't think its too much of a stretch to see a glimpse of the Potter in Genesis 2:17. But the metaphor breaks down rapidly. It's not the body that is necessary for life, but the "breath of life" that God breathes into his own creation to make him a "living being." In a similar way, Jesus compares the first birth -- physical -- with the New Birth -- spiritual. Has your Creator breathed into you the spiritual life that you need for this life and the next? We've spent some time examining the analogy of the Potter and the Clay as a metaphor of creation. Of course, a number of times, God is called "Creator." This verse points out that Creator and Father or "one who begets" have great similarities, but Father is such a core name for God, especially in the New Testament, that it merits its own chapter. 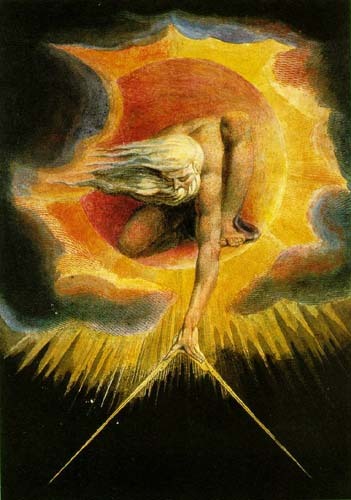 William Blake (1757-1827), "The Ancient of Days" (1794). Larger image. "For he looked for a city which hath foundations, whose builder and maker is God." (Hebrews 11:10, KJV). "Can a mortal be more righteous than God? Q2. What inherent rights does a Potter, Creator, or Maker have over what he has created? How should that effect our lives, our self-image, our sense of purpose? Here's a creation psalm chock full of names and titles of God. Read it out loud and enjoy it! and his hands formed (yāṣar) the dry land. Q3. (Psalm 95:1-7) How many names, titles, and metaphors of God can you find in this passage, both explicit and implicit? What does the Psalmist call on us to do in response to God revealed in his Names? Why are these actions appropriate? "God of Heaven," appears about 23 times in the Bible. Since it refers to the God who created heaven (and lives in heaven), I am including it among the Creator titles. It appears especially in the books written by authors who had lived in Mesopotamia. Sometimes it appears as "the LORD God of heaven" (Genesis 24:3, 7; 2 Chronicles 36:23; Ezra 1:2; Nehemiah 1:5; Jonah 1:9) and more often without (Ezra 5:11; 6:9, 10; 7:12, 21, 23; Nehemiah 2:4, 2:20; Psalm 136:26; Daniel 2:18, 19, 37, 44). It also appears in Revelation 11:13 and 16:11. "God27 of heaven and earth" (Ezra 5:11). Let's conclude with a magnificent poem of creation found in Isaiah 40:12-15, 21-31. Read it out loud and savor the words. Ask yourself, what is the point for believers in the Creator? 25"To whom will you compare me? my cause is disregarded33 by my God"? the Creator (bārā´) of the ends of the earth. and his understanding36 no one can fathom. they will walk42 and not be faint. Q4. (Isaiah 40:21-31). In this passage on the "Creator of the ends of the earth," which words are repeated in verses 28-31? What application are we disciples to derive from this passage so that we might understand God's might as Creator? We have explored being created from the dust of the earth by God our Former and Potter, Arcihtect, Builder of all things, Father of Lights, Faithful Creator, and Maker. We live our lives in the knowledge and calm assurance that, "It is He who has made us, and not we ourselves" (Psalm 100:3). Father, thank you for having a chance to explore you as our Creator. Help us to always keep ourselves in perspective, that we are the created ones and you are the Creator. Thank you for life in your image. In Jesus' name, we pray. Amen. If you have a song in this category to suggest, please let me know (www.joyfulheart.com/contact/). "All Creatures of Our God and King," words by St. Francis of Assisi (c. 1225), paraphrased by William H. Draper (1926). Tune: 1623. Words copyrighted by J. Curwen & Sons, Ltd., G. Schirmer, Inc.
"I Sing the Almighty Power of God," words by Isaac Watts (1715), tune: traditional English melody. "Joyful, Joyful, We Adore Thee," words by Henry Van Dyke (1907), Tune: Ludwig von Beethoven (1824). (Words ©1911, Charles Scribner's Sons, renewal 1939, Tertius van Dyke). "This Is My Father's World," words by Maltbie D. Babcock (1901), tune by Franklin L. Sheppard (1915). "They That Wait upon the Lord" (Isaiah 40:31) (© Gospel Crusade, Harvest Time, Bradenton, FL). Thomas E. McComiskey, `āśā, TWOT #1708. The word occurs 2600 times in the Old Testament. Thomas E. McComiskey, bārā´, TWOT #278. Werner Foerster, ktizō, ktl., TDNT 3:1000-1035, especially p. 1007. Thomas E. McComiskey, yāṣar, TWOT #898. G. Herbert Livingston, rā`a`, TWOT 2191a. Leonard J. Coppes, ḥrś, TWOT #759a. Avraham Negev (ed. ), Archaeological Encyclopedia of the Holy Land (Revised Edition; Nelson, 1986), pp. 298-304. Roland K. Harrison, The New International Dictionary of Biblical Archaeology, E.M. Blailock and Roland K. Harrison (eds.) (Zondervan, 1983), p. 318. Robert H. Johnston, "Pottery," ISBE 3:913-921. Gerard van Groningen, ḥāmar, TWOT #683c. Roland K. Harrison, "Clay," ISBE 1:717-718. Harrison sees "dry clay" rendered by several words: `āpar, "dust" (Job 10:9), ´ădāmâ, "ground" (Genesis 2:19), and ´erets, "ground" (Psalm 12:6). ´Ādām, "man, mankind, human." It should be distinguished from ´îsh, man as opposite of woman, or man distinguished in his manliness. (Leonard J. Coppes, ´dm, TWOT #25c). `Āpār, "dust," i.e. "dry, fine crumbs of earth. The noun `āpār is used literally in many contexts meaning "dust" or "loose earth." The Philistines filled the wells dug by Abraham with loose dirt (Genesis 26:15). (Ronald B. Allen, `āpar, TWOT #1664a). ´Ădāmâ, "ground, land, earth," that is, "soft, ground." To be distinguished from ´ereṣ "earth, land," and `āpār, "dry earth, dust" (Leonard J. Coppes, ´dm, TWOT #25b). See also Genesis 3:19; Psalm 22:15; 103:14. Victor P. Hamilton, The Book of Genesis, Chapters 1-17 (New International Commentary on the Old Testament; Eerdmans, 1990), p. 156. E. A. Speiser, Genesis (Anchor Bible 1; Doubleday, 1964), p. 16. Kûn, "established, prepared, made ready, fixed.... The root meaning is to bring something into being with the consequence that its existence is a certainty" (John N. Oswalt, kûn, TWOT #964). Leonard J. Coppes, qānā, TWOT #7069. Werner Foerster, TDNT 3:1007. On "Creator" see also Geoffrey W. Bromiley, "Creator," ISBE 1:800-804. Bruce K. Waltke, bānâ, TWOT #255. John N. Oswalt, Isaiah 40-66 (New International Commentary on the Old Testament; Eerdmans, 1998), p.577, fn. 12. Pā`al, "to do," occurs only 56 times in the Old Testament, and only in the Qal stem and in poetic texts (Victor P. Hamilton, pā`al, TWOT #1792). This passages uses ´êlā, the normal word for God in Biblical Aramaic (´êlā, TWOT #2576). "Enthroned" is yāshab, "sit, be seated," and could mean "to ascend the throne" or be seated on a throne (BDB 1095). "Circle" is chûg, "vault of the heavens." Some have held that Isaiah 40:22 implies the sphericity of the earth. It may, but it may refer only to the Lord enthroned above the earth with its obviously circular horizon (BDB 295; Edwin Yamauchi, chûg, TWOT #615). "Heavens" is shāmayim, " 1) the physical heavens, and 2) the heavens as the abode of God (BDB 1116). "Canopy" (NIV) or "curtain" (KJV, NRSV) is dōq, "veil, curtain." It occurs only here, where the heavens are likened to a thin veil (Herbert Wolf, dāqaq, TWOT #448b). Oswalt (Isaiah 40-66, p. 65, fn. 65) translates the word "gossamer," from dōq, "a very thin, fine thing." "Stretches out" is nāṭā, "extend, stretch out, spread tent, pitch" (BDB 642). "Spread" is mātaḥ, "spread out" (BDB 607). Their imagery of the heavens came from nomadic days when they would spread out a tent or canopy on the ground, then stretch and pitch it with poles and ropes to create a roof over their heads. "Hidden" is sātar, "hide, conceal." The root also carries the subordinate thought of protection, though that idea isn't contained in this verse (R.D. Patterson, sātar, TWOT #1551). "Disregarded" (NIV) and "passed over" (KJV) is `ābar, which has many shades of meaning including, "pass over, by, through, alienate." (Gerard van Groningen, `ābar, TWOT #1556). Yā`ēp is "be or grow weary, be faint from lack of water" (BDB 419). Yāgēa` means "toil, labor, grow, or be weary." The primary meaning is "to work until one is tired and exhausted" (Ralph H. Alexander, yāgēa`, TWOT #842). "Understanding" is tebûnâ, "understanding, insight." The background idea is "to discern" (Louis Goldberg, tebûnâ, TWOT #239c). "Utterly fall" (KJV), "stumble and fall" (NIV) and "fall exhausted" (NRSV) is kāshal, "stumble, totter, stagger (usually from weakness or weariness, or in flight from attackers)" (R. Laird Harris, kāshal, TWOT #1050). "Wait" (KJV, NRSV) and "hope" (NIV) is qāwā, "wait, look for, hope.... This root means to wait or to look for with eager expectation." Waiting with steadfast endurance is a great expression of faith. It means enduring patiently in confident hope that God will decisively act for the salvation of his people (John E. Hartley, qāwā, TWOT #1994). "Renew" is chālap, "pass on, or away, pass through, change. Hiphil, "put forth a second growth," cf. Job 14:7 (R. Laird Harris, chālap, TWOT #666). E.J. Young says, "The verb used to describe those who wait on the Lord may be rendered they shall change or exchange. In this context the though is of changing the strength one has for a better strength... What strength is possessed by those who wait upon the Lord will be exchanged for strength that is real indeed" (Isaiah, 3:68-69). "Mount up" (KJV, NRSV) or "soar" (NIV) is `ālā, "go up, climb, ascend" (Leonard J. Coppes, `ālā, TWOT #1624). "Eagle" is nesher. Young (Isaiah 3:69) sees the simplest and most natural explanation of the eagle's renewal in its ability to take flight and soar so effortlessly (cf. Proverbs 23:5b; 30:19; and Job 39:27). Other explanations of the renewing of youth (Psalm 103:5) may stem from the eagle's longevity, new plumage following molting, etc. (Milton C. Fisher, nesher, TWOT #1437). Young (Isaiah 3:69) comments, "One figure is apparently derived from runners in a race and the other from the daily walk of a man."